The Pitch: Ralph’s not bad, he just spawned that way. The Review: Video games have evolved from a curiosity in a small black box controlling two lines and a small blob to photorealistic depictions of carnage and wanton destruction, an evolution that’s happened in barely two generations. With that evolution, a host of memorable characters have come and gone, then come again in sequels, living on in homes across the world. Once upon a time, in that first generation, the majority of those games could only be played in arcades by handing over small change for 8-bit thrills, where now the arcades are almost as forgotten as the games that we played in them, at least in this country. But they do still exist, and imagine if you will an arcade where simple but classic gameplay is enough to keep you plugged in while other lesser games get taken off to that big arcade in the sky. Would the characters in those games be fulfilled with their lot after thirty years of cycling through the same repetitive actions, or would they long to break their programming – especially the bad guys? 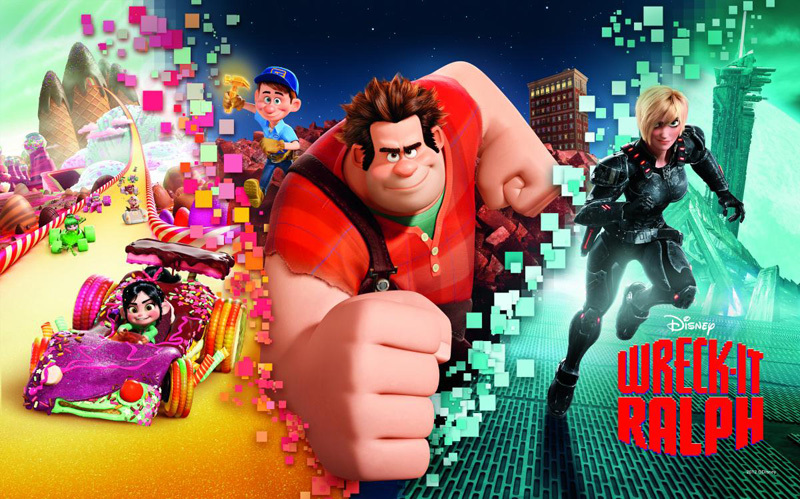 Wreck-It Ralph takes the world of video games and applies a similar logic to that of Toy Story, even though Ralph has been in development in some form since the days when 8-bit was still the standard, rather than retro chic. It’s a world where good and bad are cast in stone in the world we see, but when we’re not looking those collections of pixels can travel down the power cables and visit each other’s worlds. Ralph (John C. Reilly) would be happy in his own game if he got a little more recognition for his work as a wrecker, rather than being forced to spend the night on the garbage heap of bricks while Fix-It Felix and the other game characters spend their nights in comfort and Felix gets all the adulation. Despite the Bad-Anon group of bad guys attempting to tell him he’s a Bad Guy, not a bad guy, Ralph can’t shake the feeling that he’s really capable of more, and sets off to the Hero’s Duty and Sugar Rush games to try to find his purpose. In Sugar Rush he encounters outcast Vanellope (Sarah Silverman), but Ralph’s adventures might have dire consequences for both his game and the others. Where Wreck-It Ralph struggles compared to the likes of Toy Story is in the simplicity of its conceit. On the surface it’s just “video games come to life” instead of toys, but this is a world with more boundaries and where more rules need to be created to engineer jeopardy for the characters. While the set-up is initially complicated, it’s eased by the front-loading of characters from real-life video games – you know what I mean – so that the majority of the running time is actually focused on those characters invented for the film itself. The two leads, Reilly and Silverman, are both great, continuing a long standing Disney (and Pixar) tradition of good voice casting, and they’re rounded out by a diverse supporting roster which features the likes of Jane Lynch – admittedly delivering the same sort of patter that will be familiar to fans of her Sue Sylvester from Glee, except with slightly less offensiveness – and Alan Tudyk as the king of the Sugar Rush world, seemingly channelling Uncle Albert from Mary Poppins. But a spoonful of oddness helps this medicine go down quite nicely, and the cameos never serve as too much of a distraction; if youngsters have for some reason never heard of Pac-Man or Q-Bert, they should still get the joke. Where Wreck-It Ralph succeeds in spades is in almost every other aspect. Once you get over the slightly complex rules of the world in which we’re set, then the story works splendidly, with satisfying twists and turns in the narrative which still allow those of all ages to keep up. Ralph’s dilemmas, about his behaviour and his perception to others, are easily to relate to and there’s a good gender balance once Vanellope is thrown into the mix too. Toy Story proves another good reference point, for while I wasn’t brought to actual tears as the second and third Pixar efforts from that series managed, I was still quietly emotional by the action-packed climax and Ralph overall will satisfy both parents and children alike. There was at one point talk of a Sims-like world visit, but it was jettisoned for both narrative and logical reasons, and that care and attention to the through line and the characters will help you warm to Ralph, Felix and their friends greatly. There’s talk of using Mario for the sequel; let’s hope that it’s not game over for these characters for a while yet. Why see it at the cinema: It’s a riot of colour and sound and the wideness of the cinema screen will allow you spot all of the minor cameos from lesser video game characters. Plenty of laughs for the whole family will also work better with a big audience. Why see it in 3D: The 3D is just an add-on, and doesn’t really add a huge amount, but apart from the normal issues around brightness and glasses, doesn’t really detract much either. Take your pick. What about the rating: Rated PG for mild violence. That’s a fair enough rating, given that it’s effectively excluding only the youngest of children. My cinema experience: Saw this at the Cineworld in Bury St. Edmunds at an early evening screening on a Saturday; consequently it wasn’t full to bursting by any means. This enabled me to get a fairly central seat (ideal for 3D to minimise the ghosting effect), and a generally well behaved audience saw a screening with no noticeable projection issues, other than it being in 3D. The one point of note was that, after a week of being told my old Unlimited card would no longer work in their machines, I got both a ticket and my evening meal of choice (large hot dog combo and a small Ben & Jerry’s – dinner of champions) by swiping the card with no problems at all. The Corridor Of Uncertainty: A tidy twenty minutes of ads and trailers. Just right to keep kids of all ages happy. This entry was posted in Reviews and tagged 2013, Disney, film, John C. Reilly, movies, review, Sarah Silverman, videogame, Wreck-It Ralph.